Q. You recently lost to Zverev in Washington. How did you break him today at 5-3 in the second set? I returned — yeah, I was just walking the ball back and making him play every single ball. And at that moment, he wasn’t into it. He starts missing. He got tighter, I think. He understood that’s his chance to close the match. And I just did things right and, yeah, I broke him. That’s how you break, if you play things right and you play clever. And I did that, and I was back in the match again. Q. Sascha told us he thought the match was atrocious. He said he didn’t play that well. And then asked about your game, he said he thought you didn’t play that well either. STEFANOS TSITSIPAS: Yeah, I heard that. Well, there’s a quote that — I’m working with a sports psychologist that’s really good. And he told me something, and I remember it since like four or five years. That a good player can be seen in his bad day. And I completely agree with that. The level of tennis today, in my opinion, was not the highest. It was all right. People seemed to love it, love the show and everything. But I played — I would say I played okay. He seemed — I don’t know. The conditions are different here. So it’s really tough for me to compare with Washington. Because Washington, you know, with the conditions and everything was completely different. Speed, surface, it was slightly faster there. So I would say I played more clever this time. I kind of fooled him when I was on the court and did some things that he didn’t expect me to do. And I changed my plan since last week. And as I said, I got lots of experience last week and managed to pull it out today in the match. Q. A lot of the young NextGen guys all seem to get along. I know your mom and Denis’ they know each other, so you guys have known each other for a long time. What is your relationship like with Sascha in terms of off court? Have you practiced together and did any of that benefit you today? You said last time in Washington you were going to use the experience from the match next time you played him. So how is that coming into play today in this win? STEFANOS TSITSIPAS: Well, the match we played in Washington helped me a lot, helped me to understand some things about his game. We practiced together in Rotterdam this year. I remember that practice we had. Well, yeah, sometimes you need two times to understand something like a game style or, let’s say, a player, the way he — the patterns he uses on the court, the way he — the mindset that he has while playing. Q. What is your relationship with him like? STEFANOS TSITSIPAS: The relationship is okay. There is not — I mean, it’s all right. It’s not too bad. It’s not too good. It’s balanced. Q. Not as good as, say, some of the other younger gen players? STEFANOS TSITSIPAS: Well, the younger generation, we’re pretty competitive. So, I mean, I have good friends, but most of my friends on tour are not NextGen players. They’re like — yeah, they’ve been years on the tour. Q. What is on your mind when you’re trying to save match points against him? He had a couple in the second set. And then when he double faulted on your match point, was that shocking? STEFANOS TSITSIPAS: I was not even anything about it. When I played, I was just concentrating on each point. And I just remember that he did actually have match point. That’s true. Well, he double faulted on the match point, the last point. But did he double fault in the tie-break as well? No, he didn’t. Well, yeah, to be honest with you, I kind of suspected before he even start his motion that there’s going to be a chance for me to close it straight away. And I was not expecting a double fault, but I was at least expecting something more in my terms, let’s say. And a double fault came eventually, so, yeah, it was easier for me I guess. Q. What was your mindset going into that third set? You just completed a marathon tie-breaker to end that second set, and did you kind of realize that maybe this one was your match to win? STEFANOS TSITSIPAS: Yeah, well, we played a hell of a tie-break. We played lots of points, lots of rallies. A really exciting tie-break. The people seemed to love it. We were, yeah, very — my brain is not working after all this. I’m just so tired. Sorry. Yeah, a long tie-break. And then I — you know, we started the third set. I felt like I was there. I had — yeah, I felt like my serve was not at its best at that moment. My first serve percentage was not really high. And I was a bit — I was a bit worried about that, if I’m going to keep my first serve percentage higher. And it still didn’t work that well for me. He had plenty of break point opportunities on my serve. He didn’t convert them. But I knew that his serve was working pretty well at that moment. He was serving really well. And I was just trying to figure out things to somehow maybe — I knew that I’m serving worse than him, so I was trying to save it with some better baseline game, I would say. And I was pretty lucky, and also I used my chances at the last game. I was just — yeah, I made him play. And I was very patient, and it paid off at the end. Q. What do you expect from your next round opponent, Kevin Anderson? He’s obviously coming off of a few great weeks of tennis. STEFANOS TSITSIPAS: Yeah, a very tough opponent to face on hard courts. He has a huge serve. He can be really dangerous. So his game is really — he’s attacking a lot and takes the ball early. So again, I’m walking inside with low expectations. I know he’s the favorite again. I’m going to try to remain calm. I know he’s going to ace a lot tomorrow. He’s going to be put pressure with his serve and his returns. So I’m ready for that. And it’s going to be a tough match. It’s going to be a tough match to deal with. I’m pretty sure about it, even tougher than the match we played he today. So it’s an opportunity to do again well in that tournament, even better. I’m going to try to use my chances as much as I can. Q. So you are the youngest player since Rafa Nadal in 2006 in Monte Carlo to win with the three top 10s in the same tournament. Taking out Zverev out today, you gave Juan Martin Del Potro his best ranking of No. 3. You’re starting to leave a real sign in the game. How does this make you feel? 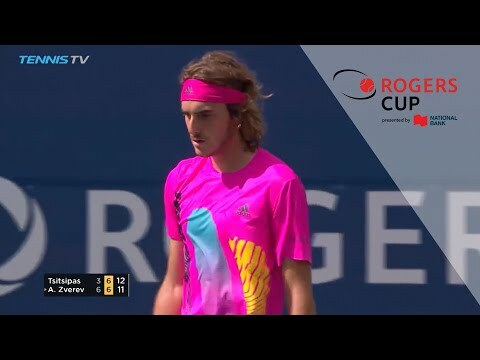 STEFANOS TSITSIPAS: Amazing. Achieving such things makes me feel nice. You know, I’m very proud of who I am and at such age to do this kind of results, which I never expected. I always thought it’s going to be take more years for this to happen. But with the hard work that I’ve been doing, it’s no surprise to me. I believe I have the game to compete against these players. I’m feeling very confident. And in terms of, as I said, of my game, I feel like I belong in this level. I feel like I have it and that I can compete against these players and play lots of matches against them and have a positive head-to-head against them. And I feel proud of myself. I feel proud of my country. And I feel proud that I’m showing my best out on the court on such big stages, and that I can make tennis in Greece the thing. Q. We talked about yesterday a year ago you were in Slovenia playing a Challenger. You made the semifinals there. I think the semis here is a little bit bigger. But just for you and the process you were just talking about, being proud of yourself, but would the guy that was in Slovenia a year ago believe that you would be in the semis here in Toronto this week or what would he think? STEFANOS TSITSIPAS: No way. No way. Of course I wouldn’t believe that. But yeah, I changed completely since last year. I’m a different player. The same person, though, but different player. I have changed a lot. I have evolved in my game. I have become a more solid player, a better thinker when I’m on the court. And of course part of this, as I said, hard work, dedication, and being really involved in the sport and loving it since my — I mean, from a very young age, and having a huge passion about what I’m doing. Q. At the end of the fifth game until the first set, you were doing some stuff with your shoulder. Q. And also it took you a long time to come in here. Anything special they you were working on? STEFANOS TSITSIPAS: With my shoulder? Q. Your shoulder and coming in here. Did you do a lot of stretching and all kinds of stuff to recover? STEFANOS TSITSIPAS: Yeah, I did a lot of stretching to recovery. Yeah, my body is a bit tight. I had a lot of the matches the past weeks. So, yeah, my shoulder was hurting at that moment. I remember doing that when I played. Yeah, I guess it was from the serve. But it’s not easy. It’s not easy when you play so many matches, tough matches, especially against top athletes, to keep your body the same every single day you compete. So it’s very important to have a good physio team next to you, a trainer that’s a fitness coach. And ATP’s doing a really good job of having all those physios. They’re amazing. We have such a good relationship with them and we share things with them. And they’re very good in what they’re doing, so they help me. That’s a big part of who I am and what I do on the court with. Without them, I don’t think I would be doing all those things, all these great results, good matches. So they help me rehabilitate and bring my body back to normal. Q. So this year, the forehand has been good. It looks like the backhand has been good. Running has been good. Why has it advanced? Q. For you. Why has it gotten better? STEFANOS TSITSIPAS: Because of hours on the court practicing and perfecting it. Yeah, I had — my team, I have a coach back at the academy where I’m working and playing. He is analyzing — sorry — and also my fitness coach, they talk to one another, and they try to see which aspect of my game I’m struggling with, and what are the things I can improve while I’m playing. Physical nowadays has become very important. Tennis is becoming very physical. So my fitness coach is in charge of that part. And my coach is also — not my dad. They’re cooperating together with my dad. He’s also trying to keep an eye and see of how I’m improving. So I feel blessed to have this team next to me that they’re always — every single day I step out on the court to practice, they want me to be better; and the mindset, the positive attitude that they give to me when I’m on the court. Q. So when you’re playing a match and you’re not playing well, do you get angry or do you say, You know what? I’m just going to continue to play. STEFANOS TSITSIPAS: Of course I’m going to continue to play. You never know. Today I was playing okay, but I was expecting — the beginning of the match was pretty awful. The start of the match, it didn’t go as I expected and as I wanted to go. But somehow managed to change things, change a bit of pace, the ball speed, just tried to get in the rally. And I concentrated more on my physical part. Tried to, you know, get every ball back and attack when the ball was shorter. So, yeah, as I said, it’s all this work I’m doing, it’s always going to pay off at the end when I’m playing a match. So that’s the point of it. Q. This weekend in Toronto, it’s the biggest Greek festival in North America. Is that something you might be interesting in going to on Sunday if you won the title to celebrate there? STEFANOS TSITSIPAS: Yeah, for sure. I was there in Greek town last night. I had dinner with friends. They were amazing today. I saw many Greek flags around the court, and they were cheering for me in Greek. It felt like I was playing at home. It felt like I was playing in Athens. Hopefully they’ll make an ATP event one day there. But it felt so — it felt so nice to have all the crowd cheering for you. And, I mean, most of the people were not even Greek, and I still felt like they, you know, they were supporting me more than my opponent who is a top 5 player. So it felt great out on the court playing in front of such an amazing crowd.